REAL estate industry players are asking the authorities to step in to control the spike in housing. International Real Estate Federation (Fiabci) Malaysia president Yeow Thit Sang says it is time the authorities look into the matter. “Home prices have gone up so much that it has reached a ceiling to the point that high-end housing developers must give a 20% rebate in the condominium segment or there will be no sales,” says Yeow. House prices have gone up many times beyond the average household income. 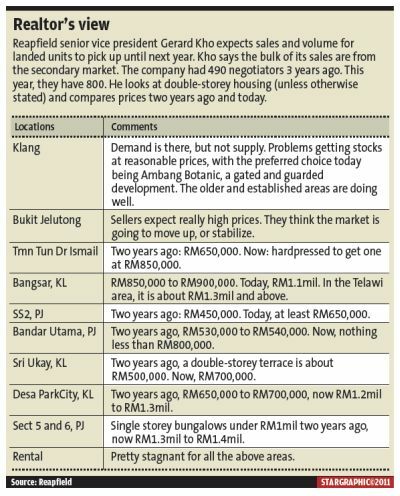 Yeow says the scenario of low-occupancy and falling prices can be found in KL City Centre and Mont'Kiara. “Overall, developers need to slow down,” he says, adding that KL Sentral is another area where office and retail properties are undergoing continuous development. Yeow says the Housing and Local Government Ministry and the relevant authorities can play a greater role in controlling prices. They can do this by studying the needs of the market the take-up rate, the number of people entering the Klang Valley to seek employment, the number of expatriate entering or leaving the country, and which type of housing is facing a shortage. “They can approve or not approve applications by developers. For example, there are too many condominiums in the KLCC area which cost millions of ringgit,” says Yeow. He says expatriates are the ones who mainly occupy these units. Many who bought into that location are local and foreign investors who expect a certain yield. When they do not get the yield they want, they may decide to sell it instead of holding on. When this happens, there is always the possibility of prices coming down. In London, Hong Kong, Singapore, China and Australia, the authorities will study the housing needs of cities. “We must do the same,” says Yeow. Currently, this is being done on a five-yearly basis, which is far from the ideal, says Fiabci Asia-Pacific executive director Yu Kee Su. The people need medium-range housing priced around RM300,000, says Yeow. Khong & Jaafar managing director Elvin Fernandez says some form of measures targeted at the property sector should be put in place. “It would be difficult for the authorities to know when to apply the brakes and when to lift the foot off the pedal if we are to use demand and supply to control prices. A better measure would be to bring back the real property gains tax on a graduated level to help curb speculation. “A second measure would be to extend the 30% downpayment requirement for second property instead of the third and subsequent residential purchase,” says Fernandez. Last November, Bank Negara required buyers of third and subsequent residential properties to pay a minimum downpayment of up to 30% while the remaining 70% constitutes a loan. Analysts say this is just a temporary setback. Fernandez also suggests doing away with mortgage brokers. “Banks want to increase their share of property loans and engage mortgage brokers, who are not bank staff. These brokers' interests are not aligned with the long-term interest of the banks. They only want their commission. Yeow reiterated the need for housing to be priced in the medium range of about RM300,000 because this is what the average wage earner can afford even in the Klang Valley. However, he notes that it is difficult to find houses with this price in the Klang Valley or Penang and this is worrying. Yeow says that the most pressing issue now is escalating prices and the question of affordability among the ordinary wage earners. His concerns are very real. House prices have moved far ahead of wages. Yeow says the average monthly household income is about RM7,500 while Fernandez puts it at close to RM6,000. He is quoting a private survey done for the Klang Valley this year. RAM Holdings Bhd economist Jason Fong says that at the national level, the average monthly household income in 2009 was RM4,025. Putrajaya has the highest monthly average wage of RM6,747 while Kelantan has the lowest at RM2,536. On a sectoral basis, Fong says the average wage for manufacturing sector (March 2011) is RM2,240 while for wholesale and retail (fourth quarter 2010) is RM2,219 and for rubber plantation (March 2011) is RM826. Kuala Lumpur has the highest average transacted property price at RM488,536 last year, says Fong. This is the least affordable relative to income levels in Malaysia in 2009. In the east coast, the lowest transacted price in Terengganu was RM74,063 while in Kelantan was RM82,337 both were relatively affordable. Fernandez says there is a need to look at housing from the perspective of the ordinary wage earner with an average income of about RM6,000 or less because of the relatively low wages in the country. “We cannot look at housing from the perspective of those earning RM15,000 or more a month. In 2008, only 1.7% of the entire population drew a monthly income exceeding RM15,000, and only 5.2% earned more than RM10,000. “In the Klang Valley, only about 3% earn more than RM15,000. This means there are not many rich people in Malaysia,” says Fernandez. He points out two fundamental factors that drive house prices household income and rental returns. House prices, as against annual household income, is normally calculated at three to four times. For example, if a household monthly income is about RM6,000, which is what the average Malaysian household earns, at four times, the price of the house should be about RM300,000 (6,000 x 12 = 72,000 x 4 = 288,000). While housing prices have gone up, rental has not. A double-storey house in Petaling Jaya was priced at about RM500,000 about two years ago while rental was between RM1,500 and RM1,700. Today, that same house is priced at about RM800,000 but the rental is only RM1,800 to RM2,000. So although house prices have gone up, rental rates do not reflect that rise. Condominiums used to have yields of about 8% while landed housing about 4%. Both have fallen to about 4% and 2% respectively today. RAM Rating Services Bhd head of real estate and construction ratings Shahina Azura Halip says the affordability issue is expected to persist as prices of residential properties, especially landed units, are likely to increase this year but at a much slower pace than last year. This is fuelled by the keen demand, higher land prices and construction costs, as well as the scarcity of landed properties in prime locations. “Bank Negara's 70% cap on the loan-to-value ratio for buyers' third residential property mortgages will deter speculation to some extent particularly in the high-end segment although the impact is not expected to be as significant in the long run, given the strong fundamentals supporting demand for homes,” she says. Meanwhile, Shahina says, the Government's recent announcement on the My First Home Scheme, which will enable those earning less than RM3,000 per month to obtain 100% financing for the purchase of their first house costing RM100,000 to RM220,000, is a positive move for the market. “The main consideration, however, is the availability of either landed or strata-titled units in this price range, especially in Kuala Lumpur, Selangor, Penang and Johor,” she says. Both Yeow and Fernandez are of the view that, at the rate house prices are moving now, those who have not bought their houses will not be able to afford one because salaries are not growing in tandem with inflationary pressures. Says Yeow: “We are in a situation where people are using the property market to gamble. “It is purely to flip. This is bad because it will only drive prices higher. This deprives the average wage earner of buying his own house. “The Government is trying to stem the bubble with various measures,” Yeow adds.